Where can you display student artwork? An art hanging system is the ideal place to showcase the beautiful, original work that you students have composed. A choice of sizes and styles lets you find a good fit for any space, whether common area or art room. 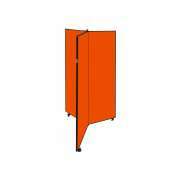 Mobile art display panels are excellent for temporary exhibitions and other special events. When you hang photos and paintings directly on a wall, you run the risk of damaging the wall and the pictures. Display panels which are specifically designed for paintings are a much better option. They give you a proper place to hang masterpieces where they are sure to be noticed and admired. How can I hang student artwork? The best way to make sure that paintings and pictures are hung properly is to invest in an art hanging system. 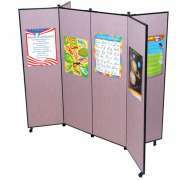 This is a convenient choice because it is specifically designed to support pictures and facilitates neat and attractive displays. Our art display panels work with pins, tacks and staples so hanging things is quick and easy. With this option, you can have an attractive exhibition up and running in a matter of minutes. Academics isn’t the only field that parents and donors care about. Arts education is great for students, and also produces some excellent pieces that a school can use to highlight their hard work. 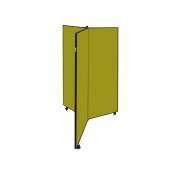 Art display panels have a clean, professional appearance that is appropriate for a banquet or gala. This can be the perfect time to show off your students’ talents and encourage various people to support the important work that a school is doing in many areas. What can I do with portable display panels? Regular display panels are great when you have things to hang, but if you don’t have lots of extra space in your building, it is preferable to invest in something portable. With portable art display panels, you can easily roll an attractive exhibition into place on the built-in casters and roll it back out of the way when you are done. This is great if you have a multipurpose space or you are having special events in the evenings but need the same space for regular use during the day. Hertz Furniture’s portable art display systems can be used for many different things. 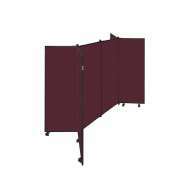 They double as room dividers, which offers an attractive way to create separate spaces for a conference or special event. With a selection of sizes, they can be used for spaces big and small. When not in use, these art display stands fold flat for storage so they are ready to go whenever you need them but don’t take up any unnecessary space.